Sandeel is a very versatile bait. There are many different ways to use sandeel whilst out fishing. Bass and pollack for example are often tempted by live sandeel either freelined over the surface or when fished further down the water column. 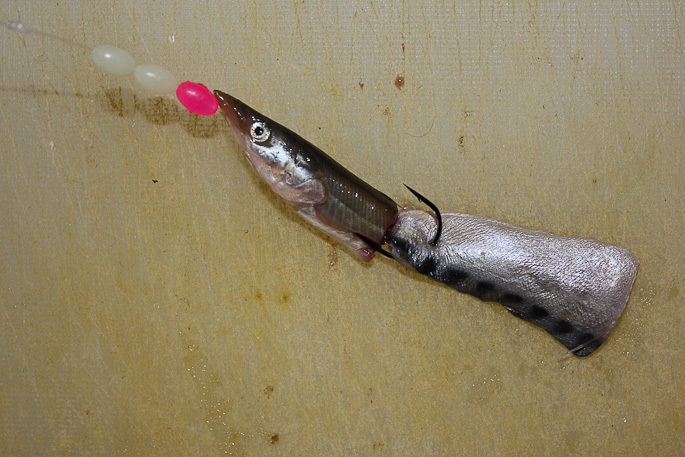 Gently hooking a live is is hard for these predetary fish to resist. 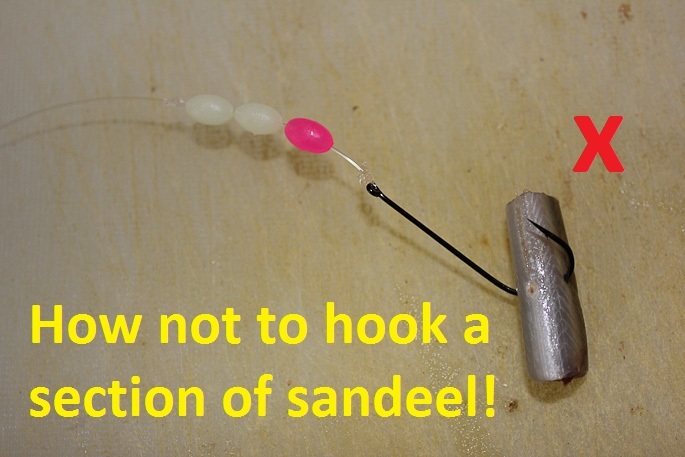 Here we look at a simple yet very effective way to mount sandeel on your hook lengths when fishing for a variety of different species and also when used in a bait cocktail with mackerel. This basic offering shown on the left can entice many different species such as dogfish, flatfish, whiting, codling, small rays and more. 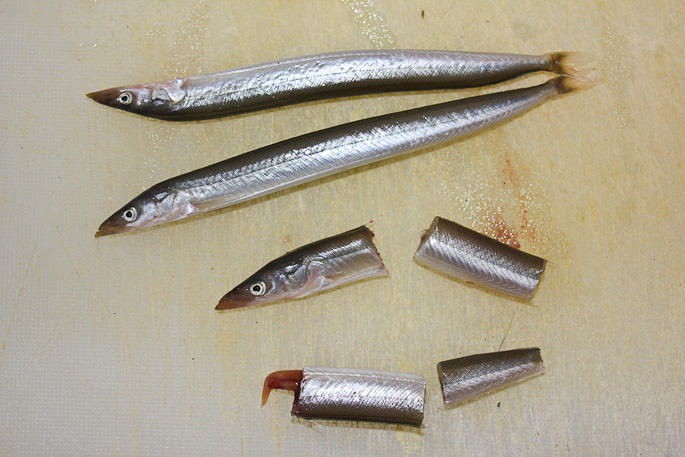 When mounting sandeel to cocktail with another bait, often it is best to carefully thread your eel section up the shank of the hook. Both photos below are using a Sakuma Manta size 2 hooks and are perfect examples of a great way to mount eel for use with another bait. Note how the thinner parts are threaded first to keep the bait streamlined in the tide. 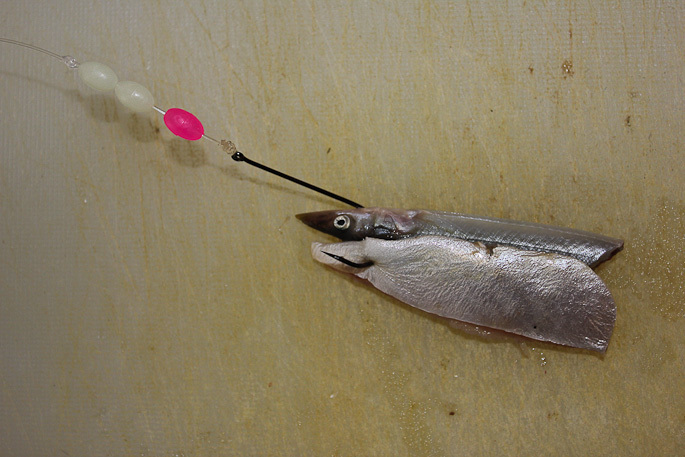 Mackerel can then be hooked onto the gape of the hook to flutter in the tide. With the tide pushing through the scent of the sandeel and mackerel, a visual attraction is this way also on offer from the mackerel. With slightly bigger baits you can help tempt species such as spotted & thornback rays plus bull huss to your hooks. 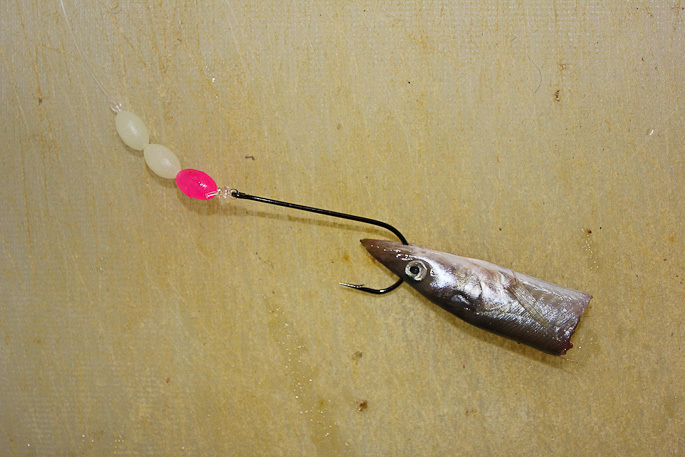 Again the photo shows a Sakuma Manta size 2 hook – strong enough to help you catch bigger prey. A photograph of how a sandeel should never be hooked.